Moana – film review | What Hi-Fi? Gorgeous animation, memorable songs, strong characters and packed with adventure and humour, Moana is a wonderful treat for the family. Moana (voiced by Auli'i Cravalho) is the strong-willed, adventurous daughter of a village chief, who longs to set out beyond the reef and explore the oceans – an act forbidden by the Motunui islanders, who claim that the island’s rich flora and fauna give them everything they could possibly hope for: food, shelter, community. But when crops start to rot and fish goes scarce – thanks to the demigod Maui (Dwayne Johnson) stealing a heart-stone from the goddess Te Fiti a millennium ago – Moana (which means "ocean" in Polynesian) sets sail in search of Maui, determined to restore the stone and save her island. Moana, in so many ways, ticks all the classic Disney film boxes. It’s fundamentally a story about adventure, about family, about friendship, about traditions and breaking them to carve your own path, overcoming hurdles, and about realising your dreams – all with some great humour and catchy songs. In fact, we’d go so far to say that Moana is the spiritual successor to The Lion King. And yes, we know just how big a claim that is. That’s backed up by the fact that directing Disney’s 56th animated feature film are Ron Clements and John Musker – two men responsible for some of Disney’s very best, such as Aladdin, The Little Mermaid, Hercules and, you guessed it, The Lion King. Frozen may be the big success story of this decade, but Moana is the closest you’re going to get to capturing that magic of Disney’s golden period in the 90s. Moana and Maui are both instantly likeable and full of charm, humour and chemistry - crucial since they are the sole characters on screen for much of the film. Voiced by the then 14-year-old Cravalho, Moana’s spirited personality, her stubbornness, and her lack of a love interest makes her a quietly radical heroine, and one that you root for from the very first moment. And Dwayne ‘The Rock’ Johnson is perfectly cast for the bigger-than-life Maui (yes, he sings, too). All the characters feel wonderfully realised, no matter how brief their appearance. From the wise grandmother (the self-confessed ‘village crazy lady’) and the sentient wave that helps Moana along her journey, to the pygmy pirates in a glorious homage to Mad Max: Fury Road (no, really) and sidekick rooster HeiHei (possibly the dumbest character ever created by Disney). The humour and gags are perfectly pitched, balanced out with the action to keep a good flow to the film. One of the highlights is comic relief/mini-villain Tamatoa the crab – voiced by Jemaine Clement (one half of musical comedy duo Flight of the Conchords) as if the crab was the lovechild of Ursula and David Bowie - and his song Shiny (another Bowie tribute). 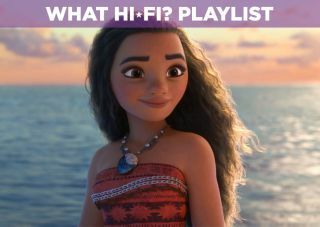 The original soundtrack is a huge part of the film and is all down to Lin-Manuel Miranda (of Hamilton musical fame), Mark Mancina (The Lion King) and Opetaia Foa’i (from contemporary Pacific music group Te Vaka). There are uplifting songs here that will stick in your head (and no doubt a small child's...) for days on end. Play the Moana soundtrack when you're in a bad mood and we guarantee you'll feel ten times happier. The film's soundtrack is mastered in Dolby Atmos as well, and we'd urge you to go seek out an Atmos-equipped cinema if possible. The film itself is simply beautiful to look at. It's entirely computer animated – Maui’s tattoos were first hand-drawn using traditional techniques – and the lush island foliage, wildlife, underwater creatures, and the night sky pushes the boundaries of CGI futher than we've ever seen. There are certain scenes that had us slack-jawed. It's a visual feast and utterly immersive. The directors and animators spent five years crafting Moana, with trips to the islands of Polynesia to get the culture, the people, and the look of the film completely right. If you had to track the progress of Disney’s animation, just look at the way they do hair. Like Merida’s voluminous curls in Brave, the animators had to create a new program to tackle Moana’s thick, black hair – required particularly to depict how it behaves when wet. Water is notoriously difficult to get right using CGI, but this is the most realistic we’ve ever seen: you can almost feel the power of the waves, the wet sand and how plants and animals behave in water. The one slight letdown is that the ultimate Big Bad isn’t a patch on classic Disney villains such as Jafar, Scar or Ursula – so you don’t get an entirely satisfying good-vs-evil moment – but the denouement is so overwhelmingly uplifting that we quickly forgive it. Everything about Moana - her story, her drive, her sense of adventure - is so convincing and earnest that you can't help but enjoy the ride for the duration of the film. When certain big-star blockbusters have disappointed at times in recent years, it's wonderful to see an original story from Disney that hits the mark. Moana carves its own unique place in the Disney pantheon thanks to stunning animation and glorious songs, a memorable roster of characters, and the exploration of a rich culture and all its beguiling heritage. It feels both familiar and new, has the feel of a true Disney classic, and we can (almost) guarantee you’ll be watching the film with a wide-eyed grin on your face. Oh and stay for the post-credits stinger; it’s worth it. Moana is out in UK cinemas now.